I would like to present my ideas of its roots in order to show my view, since that is what I base this blog on. I might be a bit kittle to trace Commedia dell’Arte all the way back to the Atellan Comedy, the Dorian and Phluakes Mimes, the Satyre plays, the Roman Mime or even to Menander, Terence and Plautus. We cannot really follow a straight line from the ancient world up to the renaissance. The Church and their ban of theatre have, among other things, been in the way. 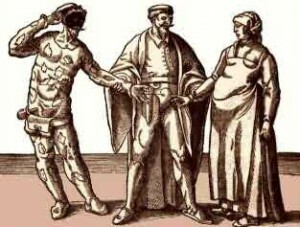 That does not mean that there are not similarities between the ancient plays and rituals and Commedia dell’Arte. There are more similarities like the type of characters, the plots and how they are built, the improvisational character of play, the trestle stages, the idea of the theatre of the actor, the frenzy and all what builds Vulgar Comedy (see HERE or HERE), not to mention the lack of en ethical or moral standpoint. To later influences we can count: the French, medieval sotteis, travelling jugglers, court jesters, pagan rituals or comic processions. We can also count the Turkish puppet theatre form Karagös and other eastern theatre genres. 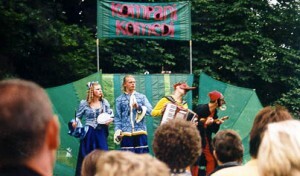 It is a bit misleading to say that Commedia dell’Arte actors were the first professional actors in Europe after the church had banned the theatre. There have been free lance jesters, and even groups of traveling jugglers and so on, who had to be professional to survive. I think of actors like Zan Polo, Angelo Beolco or Domenego Tajacalze among others. We can also see a growing market for comedy in the mid-1500, which allowed actors and groups to establish themselves.